It’s a new year, time to start everything afresh. Hope you’ll have an awesome 2012 everyone! These things are popping up like mushrooms. 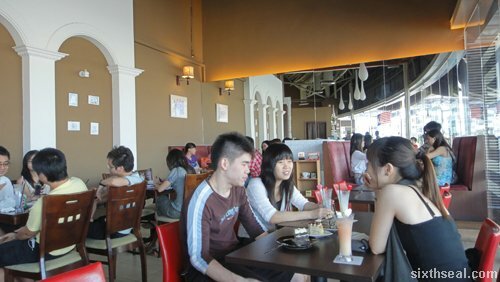 I’m currently in Johor and staying at Zoom Inn Boutique Hotel in Danga Bay for a night. 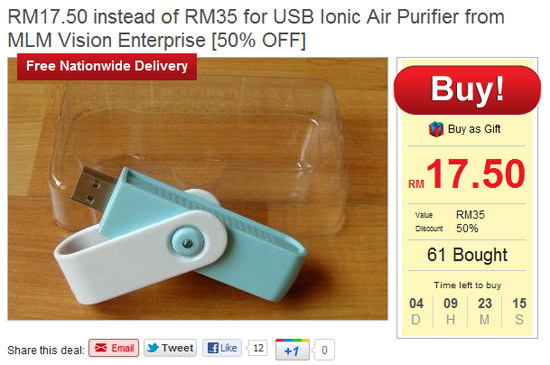 I got it online for about RM 90+ and realized that the walk-in rate is only RM 78. There are three shoplot hotels within the area (not including Tune Hotel) and from looking at all (the room wasn’t available until 3 pm) this seems to provide the best price-comfort consideration. Ill omens and portents. (!!!) Game Over all over the room. I’m not sure I want to see that whenever I open my eyes. However, it is pretty creative, each room is has its unique theme and decoration…and the repeating game over is tethered to a quasi picture frame of someone playing a console game. Very artsy fartsy. Either-Or sliding door for toilet and shower. The large LCD TV right at the foot of your bed is awesome though – it has all the premium channels but I only watch Discovery Channel or National Geographic variants/spinoffs. I’ll be happy with those channels. It also has stains on the duvet that looks suspiciously like blood. I can only imagine what the previous occupants were doing but since their hairs are still sticking to the pillows, a multitude of entirely unwanted vivid scenarios come into mind. I’m still waiting for housekeeping to change the sheets. 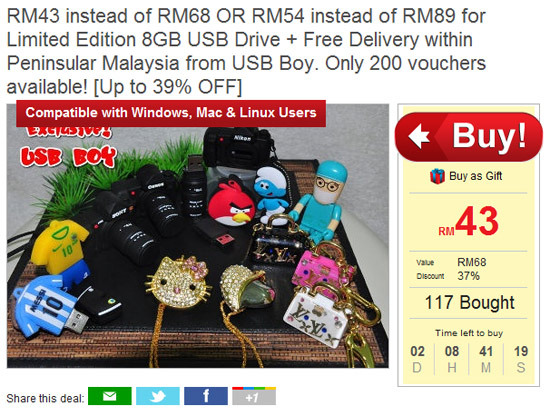 Speaking of creative, MilkADeal is having an awesome deal for novelty 8 GB USB drives in a variety of designs. 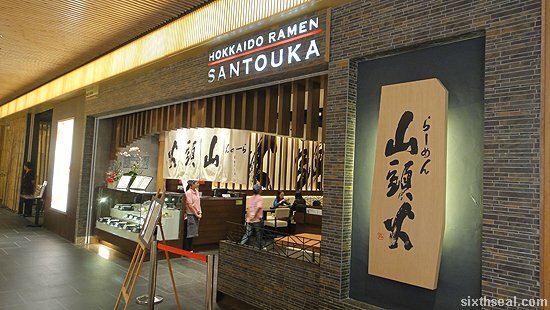 I headed down to Santouka Hokkaido Ramen in Tokyo Street at Pavilion a couple of days ago to check out their acclaimed premium pork cheek and ramen goodness. 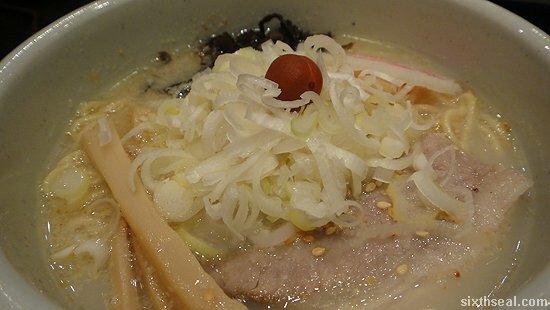 Santouka Ramen is an actual franchise from Hokkaido in Japan and I heard a lot of interesting anecdotes about it from Julian and Inggrid. This came heated in a ceramic mesh. Santouka Ramen also has the same treatment for char siu but I found the pork cheek to be slightly better. 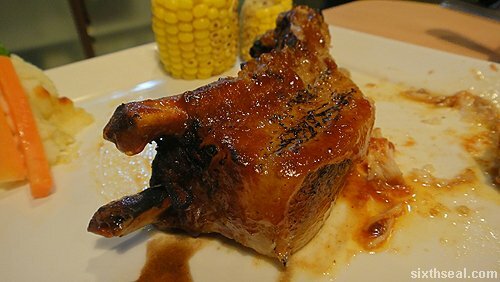 It still maintains its juiciness despite the thin slices and the tender pork cheek comes encrusted in charcoal goodness. This is translated as “salt” although it is best described as the original taste of the pork infused ramen base. It’s my favorite, hands down. It comes with a small ume (plum) on top. 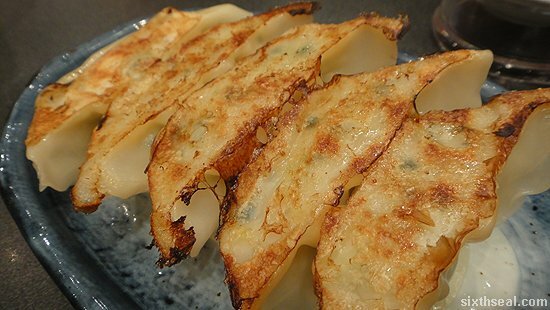 An side order of gyoza to go with your ramen. This is the soy sauce version, which tastes pretty good if you like a bit of saltiness to your ramen. I still prefer the shio though. 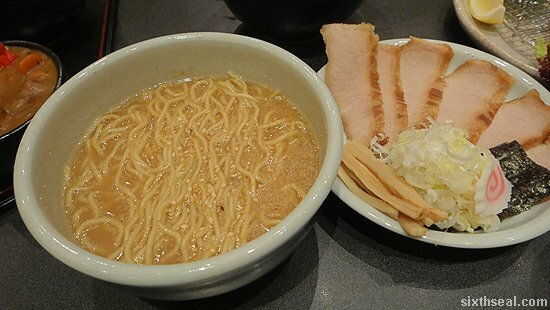 Yup, you know what this is…it’s just like what you’ll expect – ramen in miso (fermented soybean) soup. 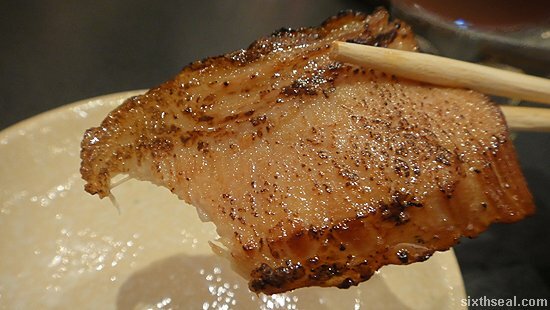 This adds a twist by adding a bit of spice into the miso soup. 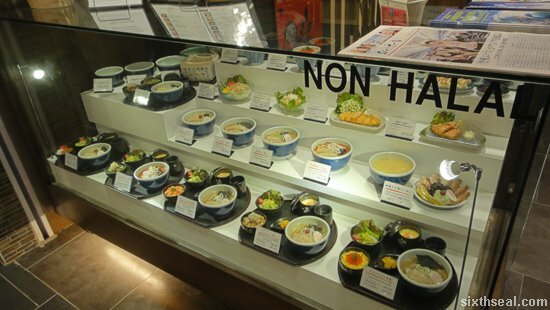 It’s quite interesting but can be overwhelming to the palate if you’re looking for more subdued ramen bases. 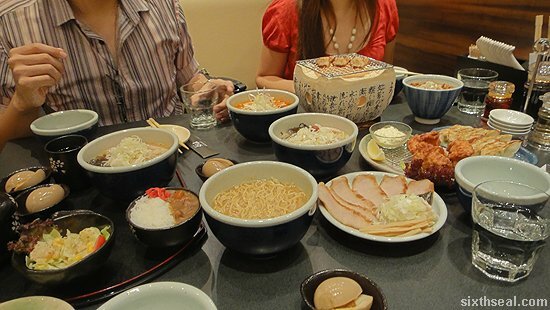 Each of the ramen bowls comes with char siew and a sprinkling of sesame seeds – the number of slices and amount of noodles differ according to the size you’re ordering. The prices are RM 22.50 (Small), RM 25 (Regular) and RM 29 (Large) except for Kara-Miso Ramen which runs slightly higher (add RM 2). 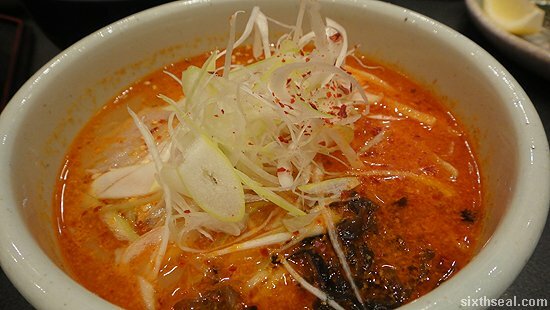 I highly recommend you order Santouka Ramen’s specialty – Tokusen Toriniku Ramen. That’s Premium Pork Cheek Ramen and they only have a limited quantity per day since you can only harvest about 200 to 300 grams of pork cheek per pig. The Premium Pork Cheek Ramen (RM 36 for Regular) comes with a side of tender and decadently fatty pork cheeks slices. 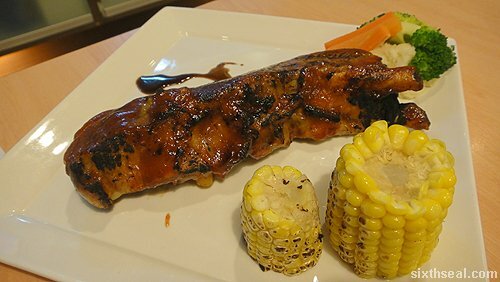 It’s different from the roasted premium pork cheeks and I found that I enjoyed this one more. 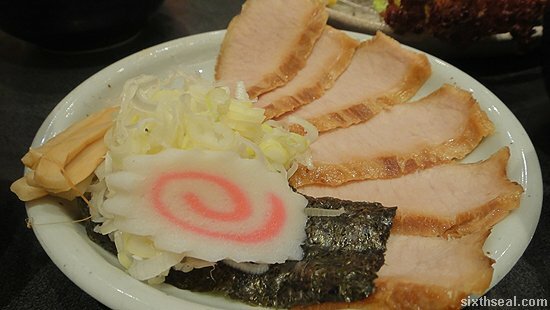 The pork cheek slices goes well with the ramen and absorbs the flavors of the ramen base perfectly. 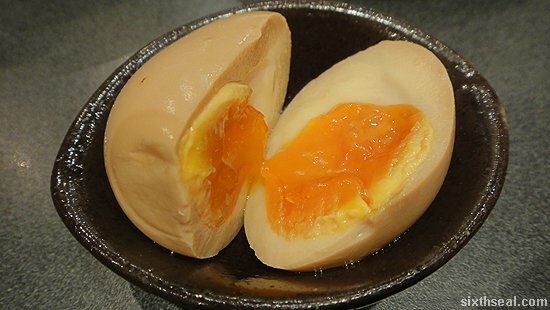 Don’t forget an order of their famous Komi Tamago (Flavored Boiled Egg – RM 2). This decadent slice of heaven is a boiled egg that has a semi-runny yolk. The flavor and texture is orgasmic and you have to order at least one or two to go with your ramen. Guaranteed satisfaction for all egg fans. Thanks for the lunch! I will definitely be going back for the melt-in-your-mouth pork cheek, shio ramen and komi tamago (the breakfast of champions). 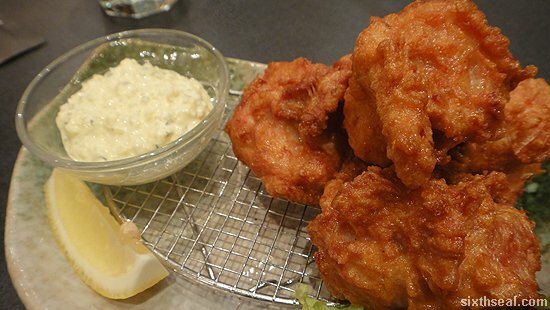 Tori Karaage – some good ol’ fried chicken as the appetizer. Want dessert? Head over to Suchan for some awesome cakes. 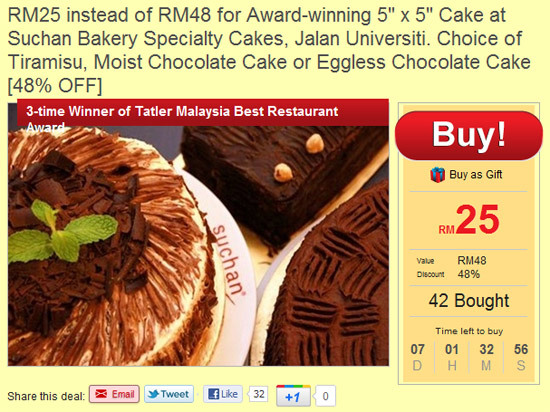 I actually bought the previous offer from MilkADeal and the cakes are superb! 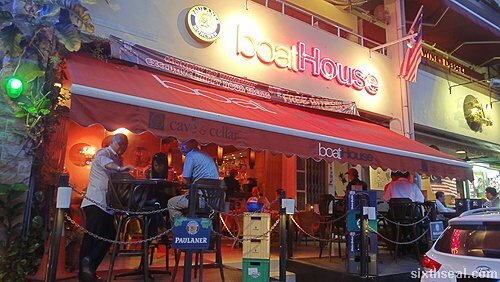 boatHouse in TTDI is one of those places which you assume is the local watering hole but actually serves excellent food! I have heard good things about boatHouse and marvelled at their interesting bar when I walked past. 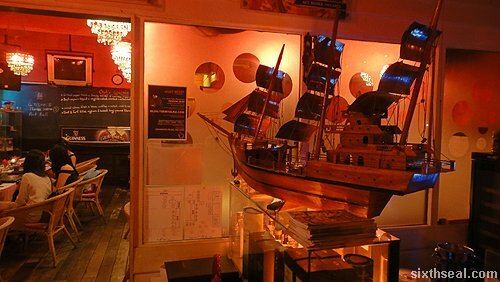 boatHouse also has a lot of ship related décor, which probably explains the name. I bet you can get the “I’m on a boat!” badge on 4sq just from checking into the place. Heh. I had 6-7 of these lovely things and boatHouse dishes up really good oysters. 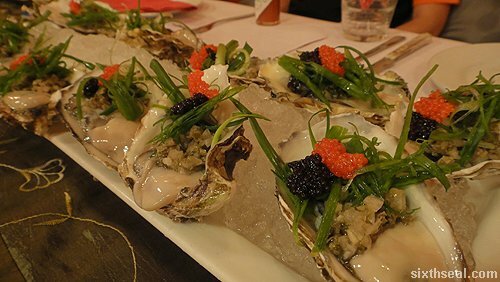 You’ll think that oysters is fairly easy to do but there are flavor and texture nuances that adds a lot to it – for this, it was the two types of lumpfish caviar and the generous scallion (spring onions) and caper bud toppings. 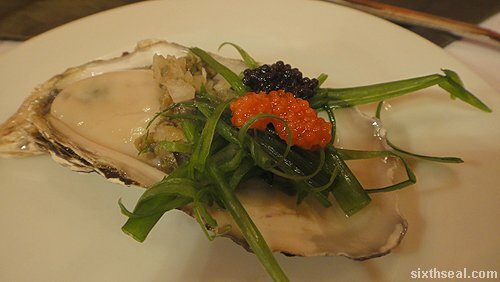 When your slurp the oyster, you’ll bite down into the juicy flesh, with the caviar popping on your palate and the spring onions bringing a nice crunchiness to the table. It’s delicious. 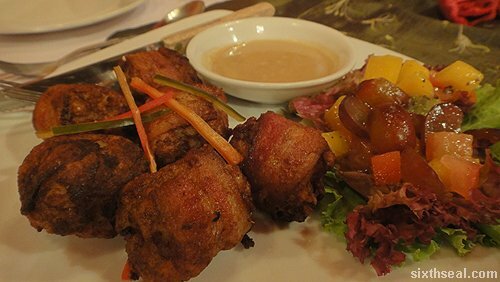 This decadent appetizer is made of pork wrapped in bacon. 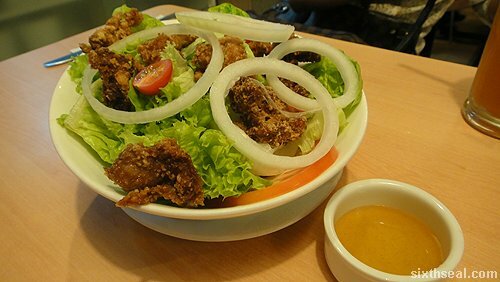 It goes very well with the dipping sauce and there’s a side of salad with cherry tomatoes, grapes, and other palate cleansing ingredients that diffuses the strong taste of the pork. I liked it, but it’s a bit too heavy as an appetizer for me. Your mileage may vary though. This is basically char siew. Lovely. 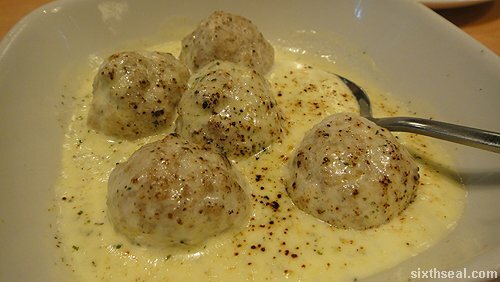 The presentation of this pasta dish is great – note the edible ornament and the sprinkling of poppy seeds (no, that isn’t pepper) on top of the dish. 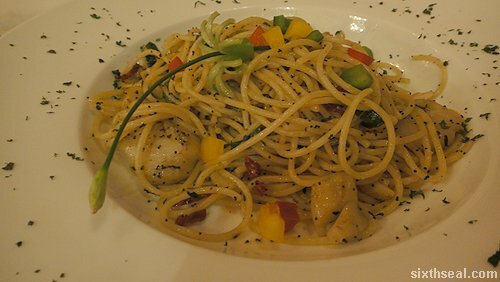 The olio (olive oil) based sauce is light on the palate and there is a generous portion of scallops lining the bed of the plate. I popped two of the scallops into my mouth and they were fresh and juicy! A feast for porcine lovers! I like how the pork belly is not excessively lean, but has a healthy layer of fat on it. I’m not sure why but every time I hear (or read) the words “rocket leaves” in a dish, it just somehow puts me off. I think it’s coz rocket leaves are the “in” thing right about now, and it seems that everyone is trying to incorporate it into their menu. 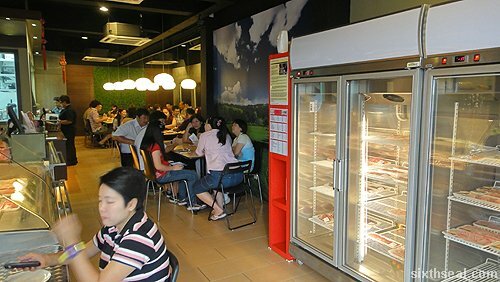 It has become kinda gimmicky in the F&B industry. 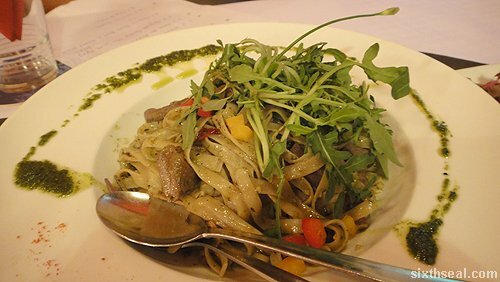 However, boatHouse surprises again by having a really good reason for putting rocket leaves into their pasta. 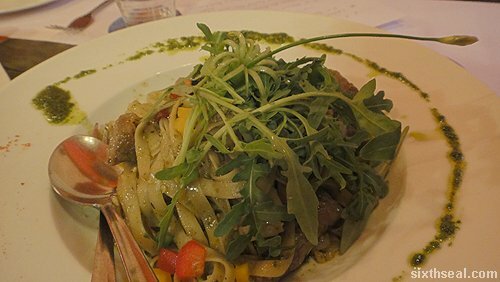 The choice of fettuccine is perfect, as it absorbs the sauce well and we were told to eat the pasta with the rocket leaves. I did just that, and I was blown away. The contrasting textures plays a delicious medley in your mouth and for once, I have to agree wholeheartedly that the rocket leaves adds a lot to the dish. This is hands down my favorite dish at boatHouse! It doesn’t look like much…yet, but wait! 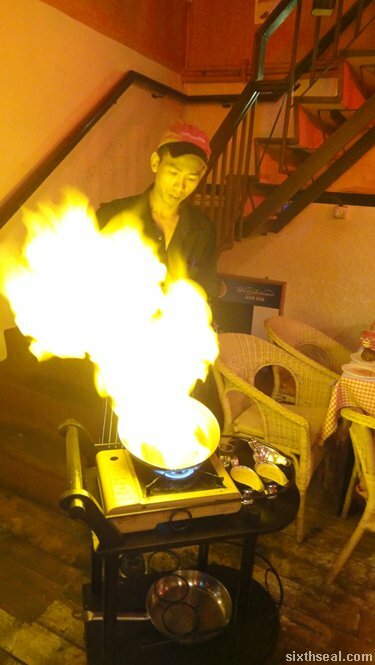 It’s prime fillet steak flamed with brandy right beside your table. Just look at the pyrotechnics! 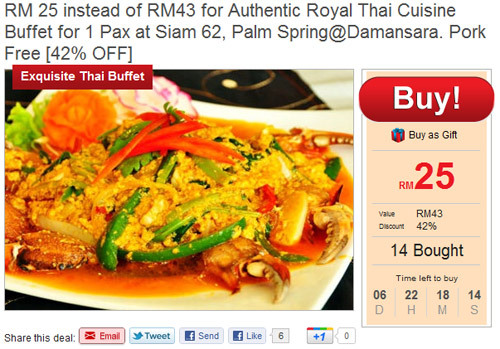 I rant a lot about how restaurants in Malaysia do not understand what “rare” means in steak parlance. boatHouse is not one of these places. They know what rare means and they do it very well! The steak practically melts in your mouth, even after I asked them to sear it three time so I could get a shot of the flames. The charbroiled steak is served with a VSOP (Very Superior Old Pale) cognac gravy which adds a lot to the flavor. It’s not just a visual feast but an epicurean one. I highly recommend this dish! This is an excellent option for those who’re not big fans of chocolate. The orange slices are flambeed right beside you. That’s right, I said orange slices. 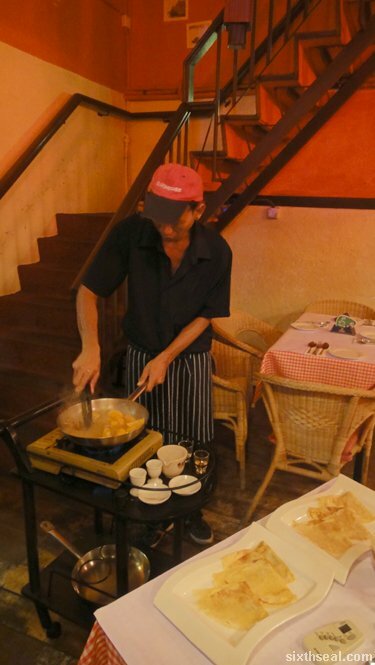 A lot of Crepe Suzette uses orange juice with liquor but not boatHouse. They use actual orange slices, and a lot of it to boot! 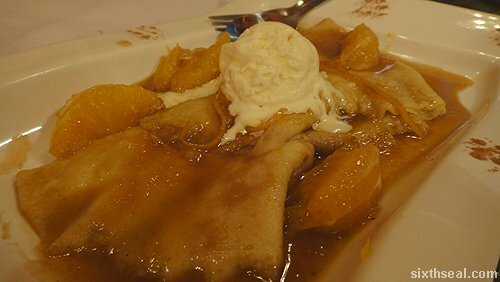 I love the light and fluffy crepes that goes into this dish. There just a hint of bitterness from the orange rinds that tops it, but that is offset by the scoop of vanilla ice cream. 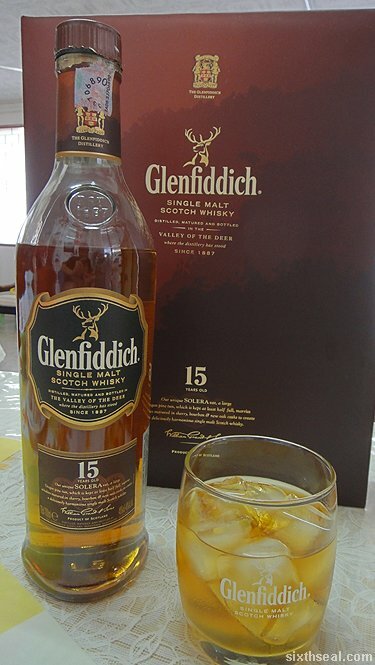 It all works together to create a complex flavor profile. It’s magnificent! 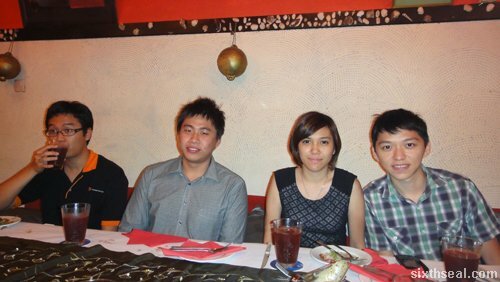 I was there for a food review session courtesy of MilkADeal and Nuffnang. This is the first time I’ve met the guys, it was a pleasure. I remember a discussion about the drinks that we had too – I think it’s a grape soda based concoction and it sure brings back childhood memories. 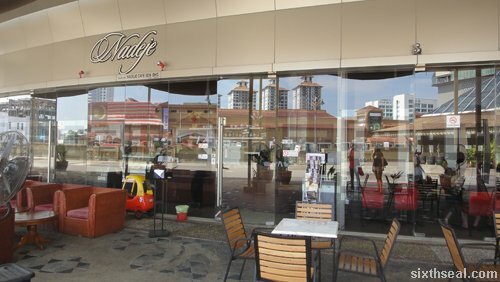 Nadeje Patisserie Cafe in Melaka serves a lot of food you’ll expect to find in a fusion restaurant but the menu has been eclipsed by their fabulous Mille crepes. Nadeje is famous for Mille crepes and a lot of people come in just to have that. 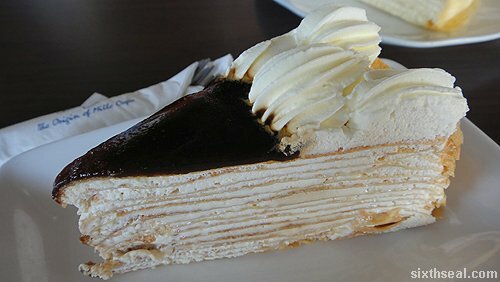 Mille crepe is a popular French cake made of many layers of very thin pancakes sandwiching a sweet cream concoction. The name “Mille” implies that there is a thousand such layers, but of course, that would be near impossible to pull off. 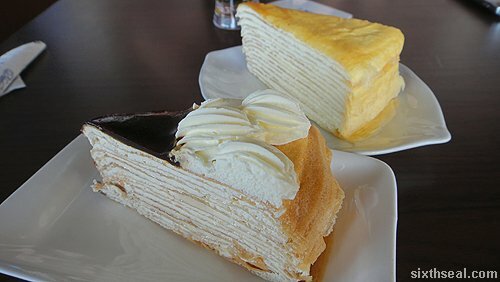 However, it does have a lot of layers and the beauty of Nadeje’s Mille crepes is that each individual layer is razor thin, with a delightfully thick cream filling. I was in Melaka a couple of days back and headed Nadeje in Dataran Pahlawan to see what the fuss is all about. 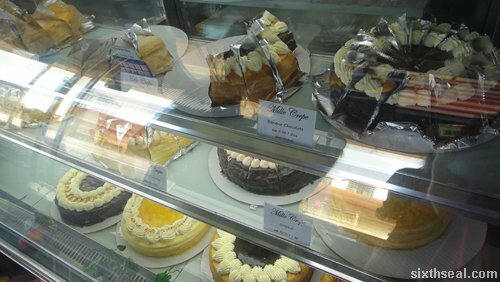 There is a wide range of Mille crepes at the counter, with favors ranging from Banana Chocolate to Tiramisu. 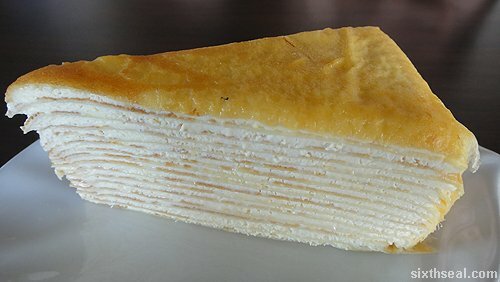 The Mille crepes goes for RM 9 per slice – it’s very reasonable pricing considering this is likely to be one of the most orgasmic cakes you’ve ever had. This is a rather intriguing coffee drink that I ordered to go with the Mille crepes. 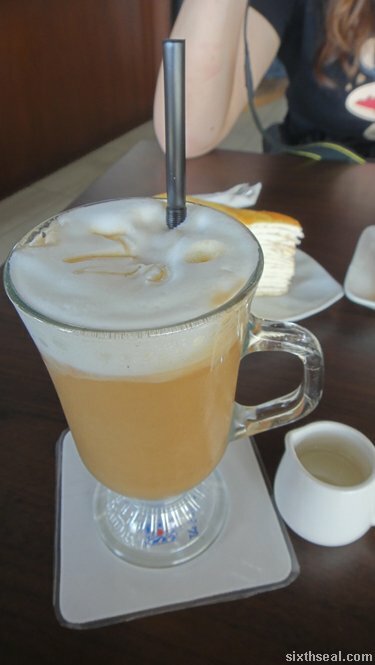 It is basically a latte with banana pulp at the bottom, which acts as a natural sweetener. I wouldn’t have thought of it but banana goes very well with coffee. Mel had this cocktail. Nadeje also serves a wide variety of fancy non-alcohol cocktails and this three layered soda-based drink is one of the famous ones. It comes complete with a heart shaped stirrer. This is arguably the best – the original is Nadeje’s signature Mille crepe sans fancy toppings. 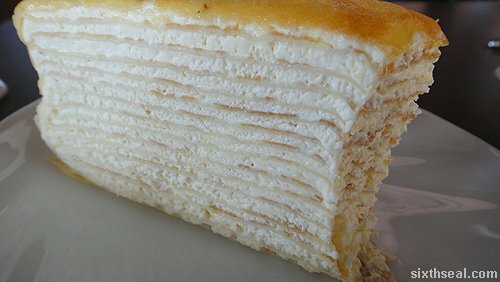 It is still regarded by many as the definitive Nadeje Mille Crepe – if you haven’t had this in Melaka, you totally missed out. It’s incredibly light and fluffy due to the multitude of layers and the creamy aftertaste is simply divine. I could eat this all day long and not get tired of it. It’s rich and creamy without being cloyingly sweet. I had a slice of this coz I figured it would be apt. 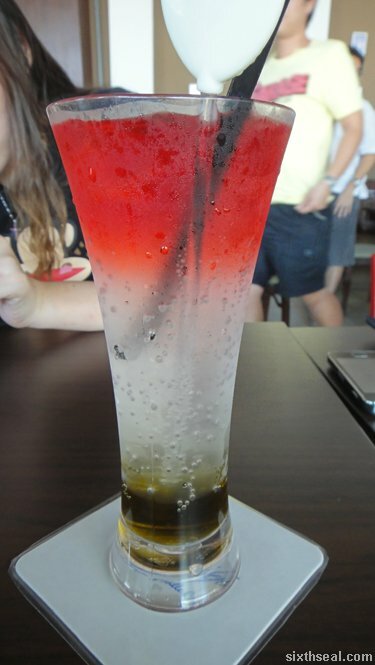 We were in Melaka for a road trip after all and I thought it would be interesting to try this East meets West fusion. It’s Mille crepe topped with Gula Melaka (palm sugar) and whipped cream. 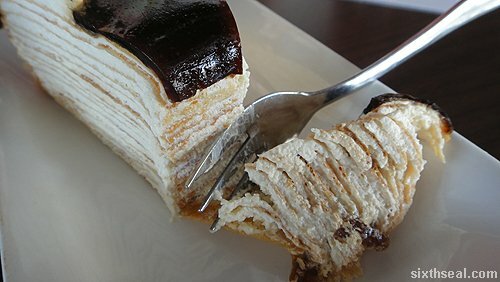 I like how the gula melaka works with the Mille crepe – it adds an extra boost of sugar to the confection and you get the unique signature aftertaste of palm sugar. Delicious! 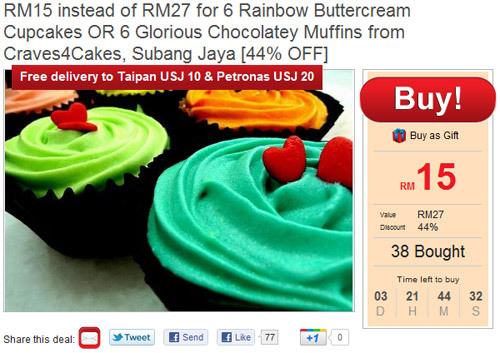 However, if you don’t feel like hitting the road, there’s a rainbow buttercream cupcake promotion on MilkADeal that looks very promising. 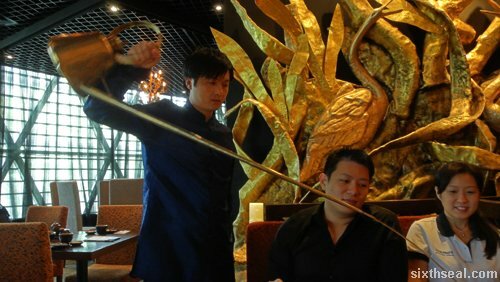 Agua restaurant is located at the new Straits Quay in Penang. It specializes in Mediterranean cuisine and the name doesn’t exactly roll off the tongue that well since it sounds like something else in Hokkien. Heh. 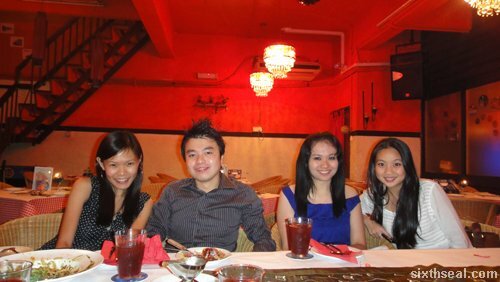 I was in Penang over the weekend and made plans to meet up with Cheryl. 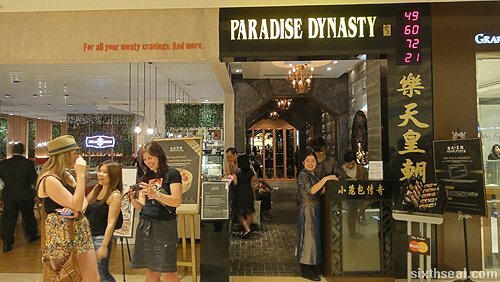 Straits Quay is a relatively upmarket place by the marina housing designer labels like Versace, but according to Cheryl most people go there for the food. 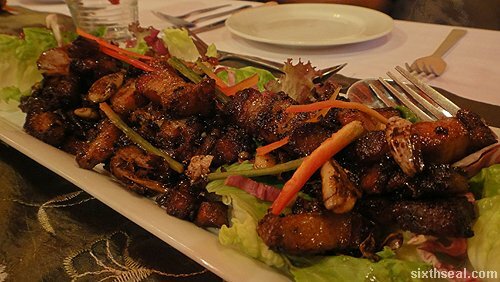 We perused the F&B restaurants listed in the directory and decided to check out Agua. 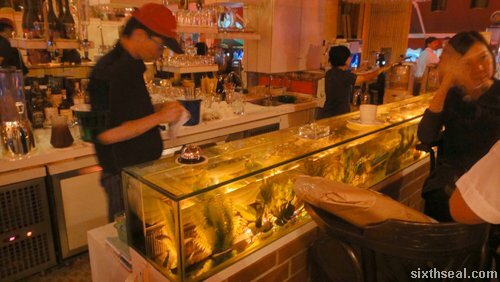 The interior of Agua is decked out really nicely – there are vintage looking paintings on the wall and a long bar to one side. 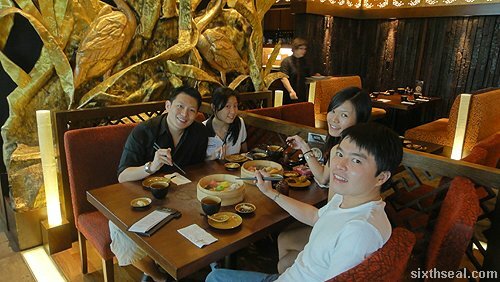 You would expect prices to be exorbitant in a place like this but it’s really quite reasonable – they have express lunch sets starting from RM 22++ and more lavish three course meals for RM 45++. This is an interesting interplay of flavors – you can literally taste both the sweet pumpkin and the tart citrus in the soup. I love the croutons as well – it’s crunchy and goes very well with the soup. Cheryl opted for this soup so we can share the dishes we have. It’s very spicy and perfect as an appetizer! How can you go to a Mediterranean restaurant and not order hummus? 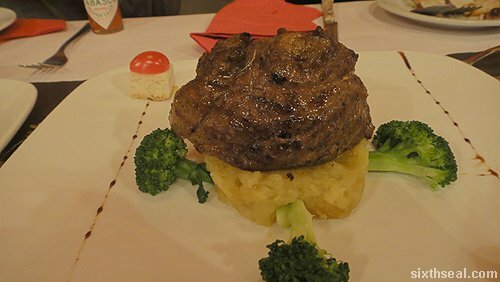 Lainey had this one – it’s off the a la carte menu and the bread tastes very fresh. I like the hummus too – you can just see a sheen of olive oil on it but it’s really healthy stuff. 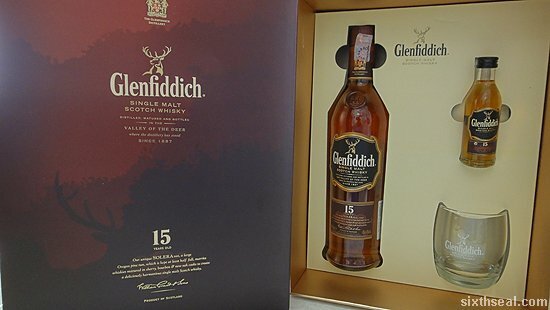 I reckon this would go perfectly with the red wine I ordered. It’s poached fish in a white wine, cream and mushroom sauce. The fish is soft and a squeeze of lemon does wonders to the taste. 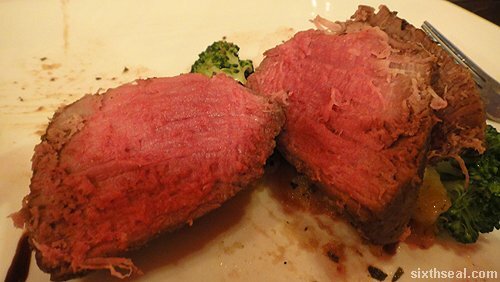 I liked the sauce and the sprinkling of herbs on top of the fillets. Lainey opted for this one. I didn’t quite like the taste but I’ve never liked tomato based sauces anyway, I’m more of an alfredo kinda guy. 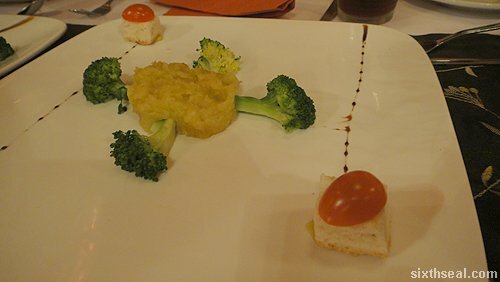 It tastes pretty authentic though with just a pure and clean-on-the-palate mixture of tomatoes, onions and peppers. 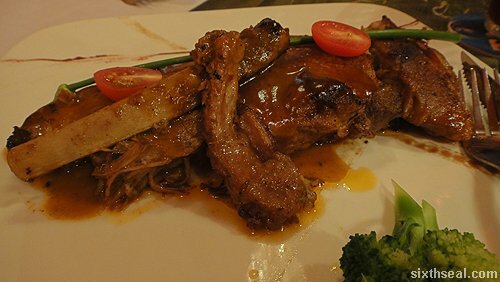 It is listed as marinated beef roasted and sliced thinly with salad and rosemary potatoes. 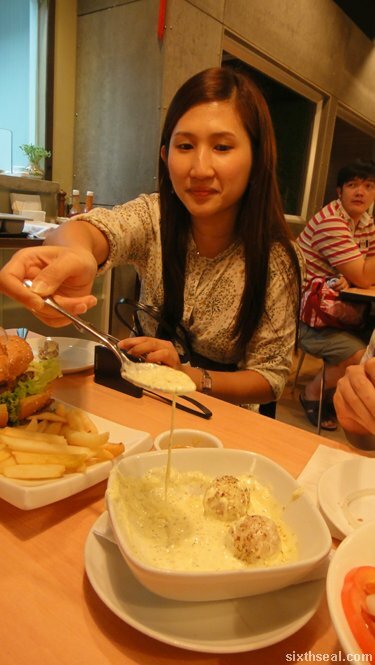 Cheryl had this for her main dish and I was surprised when I tried it coz I didn’t expect much from the description. 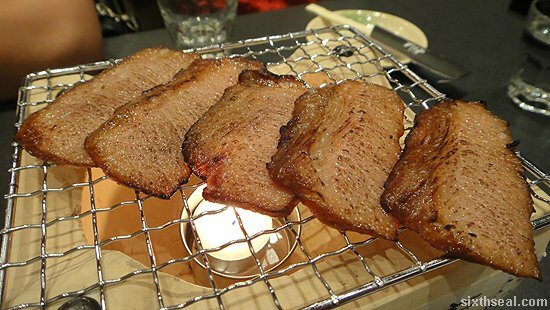 The thin slices of beef is very flavorful and slightly juicy. It’s served cold and I think I ended up eating a lot of Cheryl’s marinated roast beef. Tasty! The girls had a scoop of chocolate and strawberry ice cream. The serving sundae cups are frozen before the ice cream is put in – you don’t put hot food on a cold plate and you don’t put cold desserts in a room temperature cup. Agua understands that and it’s this attention to detail that I like. 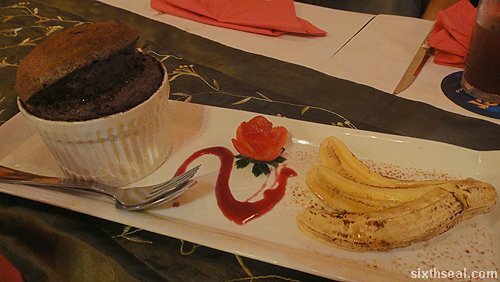 I thought they served me the wrong dessert at first – I expected dry figs instead but this concoction topped with vanilla ice cream just hits the spot. The brandy syrup goes very well with the figs. Agua also has Iberico ham on the menu and their signature dish is the Valencia paella with seafood, chicken and pork. 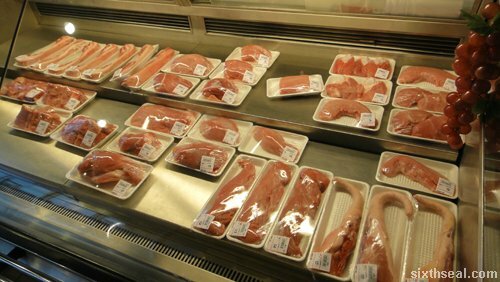 It takes too long to prepare though and we had to drive down to KL after, so we reluctantly opted out of that. 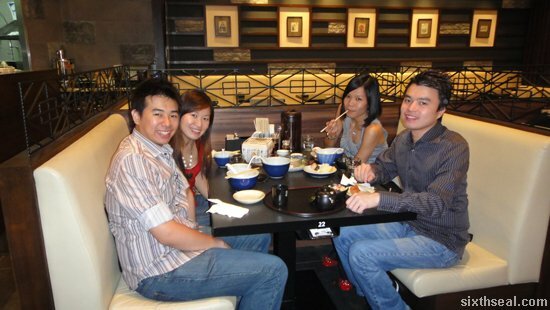 However, Cheryl is coming down to KL soon and she was talking about eating at Sanbanto coz she’s heard so much about it. 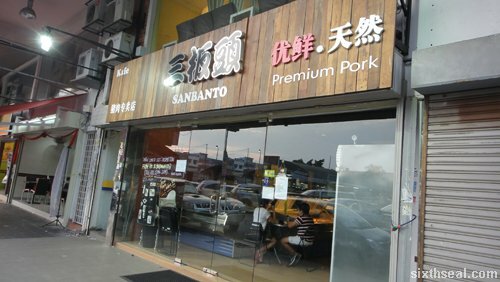 Sanbanto has achieved almost a cult status among porcine lovers in KL. They have their own butchery and their menu is filled with pork delights. 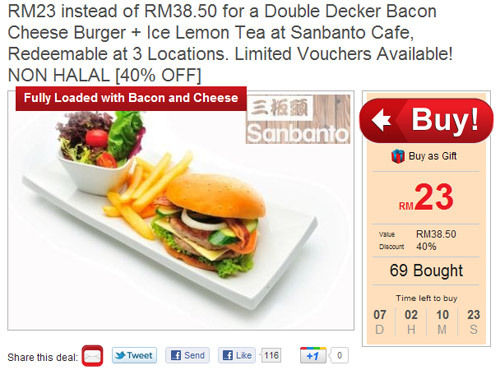 I was surfing MilkADeal and I came across this promotion for a Double Decker Bacon Cheese Burger. 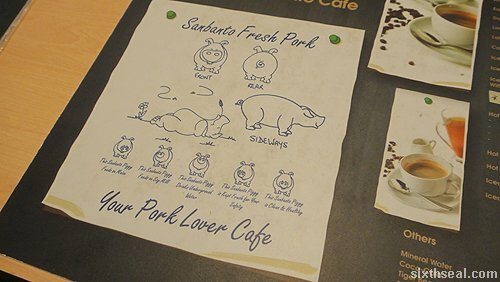 Sanbanto makes their own patties and it’s a coincidence that the redemption period for this is when Cheryl is coming down so I got one of the vouchers. 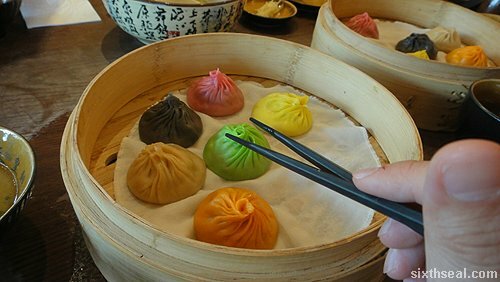 Signature 8 flavor Dynasty Xiao Long Bao with foie gras and black truffle! Okay, this is one of the most interesting and unique things I’ve heard in a long time. 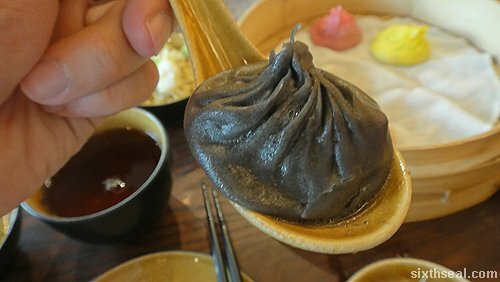 There’s an 8 flavor xiao long bao course at Paradise Dynasty which includes premium fillings like black truffle and foie gras. I couldn’t wait to try it when I first heard about the concept. 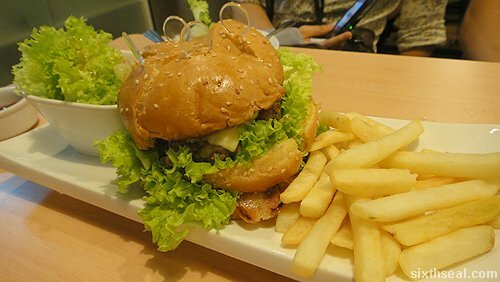 I headed down to ION Orchard in Singapore yesterday with Lainey to meet up with Michelle and Ben just for this. 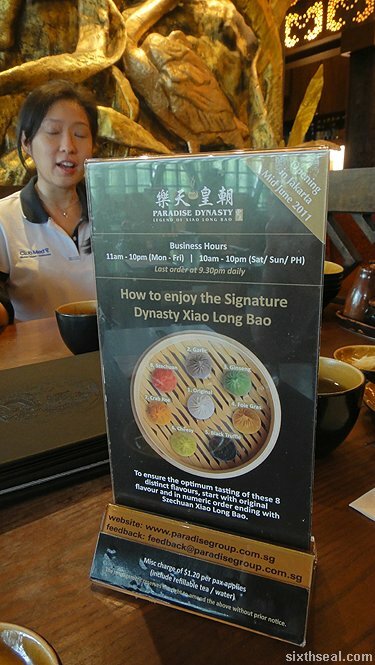 Paradise Dynasty claims to have the world’s first 8 flavored xiao long bao and you have to eat it in order. 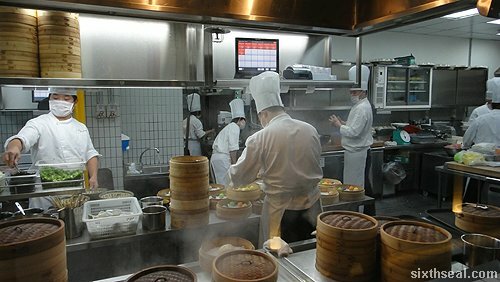 The restaurant is famous for it – the open kitchen is filled with cooks preparing it and a lot of patrons order this specialty. The set costs SGD 13.90 and it’s well worth the price. 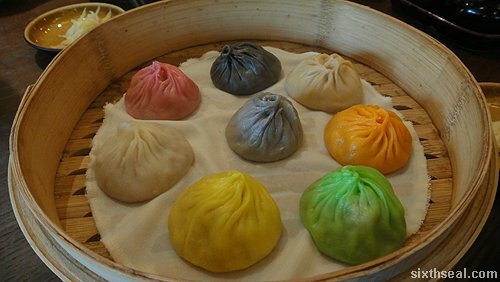 I found the Garlic and Ginseng xiao long pao very flavorful, with the juices bursting from the skin as you bite into it. The Foie Gras and Black Truffle ones are suitably decadent and I loved the Crab Roe filling too. 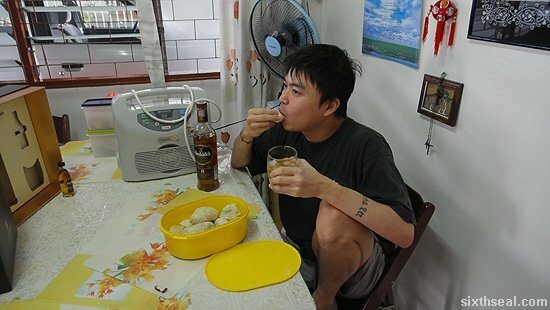 However, I felt that the Cheesy xiao long pao should have been #7 as the overpowering taste of cheese can be a bit…well, overwhelming. The Szechuan deserves its final spot as the filling is extremely spicy (even for my desensitized taste buds).